They say that the way to a man’s heart is through his stomach. In my case, this was particularly true. In the early days of our relationship I remember plying my man with rich stews of lamb shanks in red wine sauce served with super-creamy mashed potato, mixed seafood platters served on a lazy Susan with a big bowl of chips and a selection of dipping sauces set in the middle and regular full Irish breakfasts. He still jokes about how he could hear the “chitzzz” of a fresh beer being opened as soon as he set an empty bottle down on the table. But it worked. Perhaps I’m also interesting, fun-loving, adventurous and whatever else men have on their wish list. But first and foremost I was the provider of damn-tasty meals. Ten years on and still nothing makes me happier than serving my man the food he loves. Since moving to Lithuania I have been attempting more and more traditional Lithuanian dishes. The ingredients are easy to come by and are generally inexpensive and, as I’m exposed to the cooked dishes in friends’ houses and in restaurants, I now know what it is that I’m trying to produce. One of Arūnas’s favourite Lithuanian dishes is koldūnai (kol-doon-ay), small dumplings that come with a variety of fillings such as meat, curd cheese or diced mushroom. While these dumplings are quite like Italian ravioli they are not typically served with a sauce. Instead, they come with a generous dollop of sour cream which you then stir through your dumplings, giving them a rich, silky coating and a slight tang. Arūnas loves his served with spirgučiai (pronounced spear-goo-chay), made with fried onion and bacon belly (side). The sweetness of the onion and the salty crunch of the bacon pair perfectly with the slippery, subtle taste of the dumplings themselves. These dumplings are really quite easy to make – rolling the dough is far more straightforward than its Italian cousin, pasta. The dough is softer and can be rolled with a rolling pin or glass – no pasta roller is required. As they’re quite small they can be a bit fiddly, so I generally make a large batch and freeze the rest for future meals. The dumplings cook from frozen in minutes, making them ideal for last minute lunches or unexpected guests. INGREDIENTS: For the dough: 350 g | 12 oz plain flour (all-purpose flour) 2 medium eggs 70-100 ml | .5-3.5 fl oz water For the meat filling: 700 g | 1.5 lbs pork mince (ground pork) 125 g | 4.5 oz fine breadcrumbs 3 tsp onion powder 1 tsp garlic powder 1/2 tsp salt For the topping: 250 g | 9 oz smoked bacon belly (side) or pancetta, finely diced 400 g | 14 oz onion (about 4-5 medium onions), finely chopped Sour cream METHOD: Place the flour, eggs and 70 ml (2.5 fl oz) of water in the bowl of a food processor. Pulse for about 20 seconds to combine. Add more water, a little at a time, as needed to bring the dough together. You want a soft ball that is only very slightly sticky to touch. If you don't have a food processor you can mix the dough in a large bowl mixing with either your hand (as you would pasta) or a metal fork. Wrap the dough in cling film (saran wrap) and rest for at least 15 minutes while you make the meatballs. Place the mince (ground pork), breadcrumbs and seasonings in a bowl. Mix well with your hands to thoroughly combine the seasoning and breadcrumbs into the meat. Using about 1 teaspoon at a time, roll the meat mixture into small balls about 2.5 cm (1 inch) in diameter and set out on a tray or board. Having all the meatballs ready in advance speeds up assembly of the dumplings, helping to prevent the dough from drying out. Cut the dough into two pieces, keeping one half wrapped in the cling film so it does not dry out. Lightly flour a board or table. Using a rolling pin or the side of a glass, roll the dough to a thickness of about 2 mm. (When rolled, each half of the dough should measure roughly 40 cm x 45 cm (16 x 18 inches). If it is not this size then your dough is not thin enough and you will run out of dough.) Using a pastry cutter or glass, cut the dough into rounds about 6 cm (2.5 inches) in diameter. Working quickly so that the dough does not dry out, place a meatball on the centre of each round of dough. Flatten the ball slightly so that it forms a circle with 1 cm (1/3 inch) of dough around the sides. Fold the dumpling in half and pinch the sides of the dough together to seal. The dough is quite stretchy and should be slightly sticky so it should form over the meatball and seal together easily. If your dough doesn't stick together to seal you can dampen one side with water using a pastry brush or your finger. Be very sparing with the water - you don't want to alter the consistency of the dough. As you make your dumplings line them up on a lightly floured baking sheet or board ensuring that they are not touching. They can stick together quite easily. When you have assembled all the dumplings using one half of the dough, repeat with the other half. (If you roll out all the dough at the same time it will dry out before you can assemble the dumplings.) To prepare the meat and onion topping, place the chopped bacon into a cold pan and set over a medium heat. Slowly render the fat from the bacon, then add the chopped onion and fry for about 8-10 minutes until the meat starts to crisp and the onions soften and start to brown. To cook the dumplings, bring a large saucepan of water to a rolling boil. (As the dumplings are well seasoned I don't add salt to the water. However, you can add some if you like.) Add the dumplings to the pot a few at a time, ensuring they don't stick together. Bring the water back to the boil, reduce the heat and simmer for about 7 minutes. Cut one dumpling open to ensure the meatball is fully cooked before removing the dumplings from the water to serve. Serve the dumplings in bowls topped with the fried bacon and onion and a dollop of sour cream. These dumplings freeze well and cook in minutes from frozen. To freeze, lay the dumplings on a lightly floured baking sheet or other freezer-proof board, ensuring that they are not touching. Place the board flat in the freezer and freeze for at least 8 hours or overnight, then transfer to a zip-lock bag or freezer box. To cook, follow instructions as above but increase the cooking time to 10 minutes. Again, test for doneness before removing the entire batch from the water. Notes on ingredients: You can use any kind of meat you like for this recipe - pork, beef, lamb, turkey or even vegetarian meat substitutes. You can also use any kind of breadcrumbs for this recipe. Using different breads will give the meatballs a different taste and texture, so experiment to find what you like. I currently use Lithuanian medium rye bread which is moist and rich and adds a hint of sweetness to the meat filling. Lithuania is king when it comes to smoked fatty bacon - the array available in supermarkets and farmers' markets is breathtaking. Many people still have a cold smoker in their home and produce fantastic home-smoked meats. You can use any fatty bacon for this recipe, but if you live near a Lithuanian or Polish supermarket I suggest you give their smoked bacon a try. I never use fresh onion or garlic in either meatballs or burgers. No matter how finely you chop them they always seem to prevent the meat from compacting nicely and the final product takes longer to cook. The meatballs at the centre of these dumplings are particularly small and are cooked quickly, so using the fresh vegetable as an alternative to the powder won't work. If you don't have onion or garlic powder you can either substitute your own favourite dry seasoning (watch out for salt content) or just leave them out completely. These dumplings are quite like Italian ravioli and can be served with grated hard cheese or in any way that you would typically serve meat-filled ravioli. Update Jan 2016: Based on recent feedback from readers I have retested the recipe to ensure there is sufficient dough to cover all of the meat. While my quantities were sufficient they were "just right", so I have increased the dough quantity slightly to ensure you don't run out. Note that you need to roll your dough very thin, as outlined above. The dough thickens a little as it cooks so this really is thick enough. However, if you prefer your dough thicker you might wish to make a double batch of dough upfront to ensure you don't run out. Any leftovers can either be frozen or cut into strips and cooked like pasta. Note also that the recipe is based on using medium eggs. If your eggs are large, use less water (50 ml | 1.5 fl oz) initially, adding more as needed. HI June, I reserched Koldunai for my granddaughter who is writing a paper for school on how to make it. My family has been making Koldunai for probably 100 years and it would have been fun to compare ingredients and technics. What I will tell you is our dough is made from hot mashed potatoes, eggs, flour, salt, and dry Farina cereal. The meat varies I use 1/2 beef and 1/2 ground pork, seasoning, bread crumbs, and 1 egg. I roll out the dough on a floured surface cutting enough for each meatball wrap them not leaving any holes and drop in boiling water for 30 minutes. I transfer to a pan and heat in the oven topping with bacon and onion which has been chopped and fried at least half way to heat before serving. It’s a lot of work so we only make it for Christmas Eve when we in a very good mood. My son purchased a new manual dumpling maker from Crate and Barrel. Worked well to create uniform dumplings. I’d bet that most all of those scrumptious dumplings, if I didn’t get my fill the first main course meal, would be great right away again in some buttered honey & nutmeg, as dessert. or breakfast next morning.They all look and sound fantastic. Hi June. I have always used crumbled bacon in my kugelis. The use of chicken is an interesting twist, I look forward to trying your recipe. The flavour of the chicken really permeates into the potato, Borris, and makes for a very satisfying meal. I really hope you enjoy this variation! Remembered growing up in my small town in Illinois a dish using cabbagge. It is a Hungarian or Polish dish. Very simple but delicious. Cabbage, Onion, Kuluski Noddles, Bacon, Butter, are the base ingredients. Saute the onions to breakdown the sugar and your on your way to a treat. Hi Gene. I’m not sure exactly which dish that is but it sounds delicious! You can’t go too far wrong with those ingredients – butter, caramelised onions, bacon, cabbage – yum! Haluski is the name of the dish. Sorry did not include. Thanks Gene – I’m definitely going to look that one up! Thanks folks! Delighted the recipe helped, even if you were a little short of dough. I think I’ll revisit the recipe and increase the dough quantity as I don’t want people to be frustrated. Better to have a little left over than to have to make a second batch in the middle of building your virtiniai. Kugelis is first on my list for this year! Thank you so much for sharing this recipe. I made the dumplings today. However, the dough turned out to be so sticky, I had to add more flour, and I also did not have enough dough to cover 1,5 lb of ground pork. So I made the same amount of dough again and still could have probably used some more…The dumplings turned out good (although I think they were a litttle bit too hard because of the additional flour…). We all enjoyed eating them….Wonder if I did smth wrong with the dough though…. Hi Inga. Thanks for your feedback. I’m delighted you tried the recipe but so sorry it didn’t work out as it should. I do test all my recipes at least 3 times (esp. the Lithuanian dishes, which are relatively new to me) before I post them. It is a while since I made these but I will check it again to ensure the proportions are correct. The flour to water ratio is always tricky as so many factors can influence the absorbency of the flour – the brand, the time of year it was milled, how fine it was milled and even altitude and humidity. Each can cause small variations. I find with my sourdough (which I make a few times a week) that even when I weigh my ingredients exactly it is sometimes a little sticky. I usually get round this by rolling on a well-floured board and with a floured rolling pin. This way the dough only takes in what it needs on the surface not to be sticky but doesn’t change the overall consistency of the dough, which could result in it being a bit tough like you’ve described. There could be a few reasons why you ran out of dough, essentially all about how tightly rolled the balls are. If your mince (ground meat) is quite chunky it will be hard to roll into a very tight ball. Similarly, if your breadcrumbs are chunky it can be hard to roll tight. Try to use meat and bread that are very finely ground so you can get really tight balls. These then need less dough to cover them. Squeezing all the air out of the meat is also really important for the cooking as air expands as it heats and any air left in the meat could cause your dumplings to split open during cooking. Apologies again. I put a lot of time into my recipes as it’s really important to me that they are reliable. I will test it again soon and tweak either the ingredients or method if it’s not quite right or not clear enough. June. Hi Inga, just to let you know that I have retested the recipe and made a few tweaks. I have increased the quantity of dough slightly and made it clearer that only part of the water is used initially, with more added gradually as needed. I have also given more specific instructions around rolling the dough as if it’s not rolled thin enough you can quickly run out. If you happen to make these again I would be very keen to get your feedback on the revisions. Thanks again, June. It is so nice to find others who truly enjoy cooking as I do. Your recipe looks fabulous and I’m looking forward to trying it. Thank you for sharing! Thank You for this great recipe. I grew up in Lithuania and now live in U.S. but I miss the food. Lately I have been going thru this crazy stage in my life where I am trying to make and cook everything from my childhood. Wish I could find a good Lithuanian recipe book. Thanks Regvita. There’s definitely a shortage of good Lithuanian cookbooks, especially in English. So many books assume you know how to make the dish and just give you a list of ingredients with hardly any instructions. If you tried the koldunai I hope you liked them! If you are on Facebook, try the group page Our Mothers Lithuanian Recipes. A wealth of recipes, with variations as our Mom’s taught us. Thanks Jennifer! I’m actually a member of that group. You’re right – it has some great recipes and tips. Another good one to try is the “I love Lithuanian Food” Facebook page. 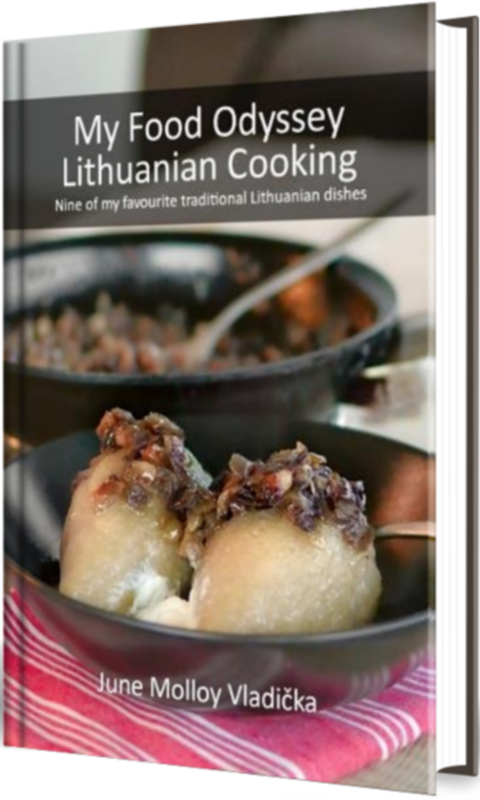 Again, lots of tips and photos of delicious Lithuanian dishes. This is a new blog for me to follow. Danny and I both love dumplings so I can’t wait to try these. June, I am going to make this. Both Danny and I love dumplings and these look really good. Thank you, I am saving and sharing. Thanks Sarah! They really are tasty – hope you both enjoy them! My Lithuanian grandmother used to make dessert koldunai with the leftover dough after she ran out of the meat or cheese filling. She’d use home-canned sliced peaches for the filling. Then after they were boiled she would fry them in butter and put cinnamon sugar on top. More than 50 years later I can still remember how delicious they were. That sounds seriously yum, Donna! I’m definitely going to try that. Thanks! We lay out dumplings and cover with a sauce of bacon, onion, butter, sour cream and bake covered. The sauce will curdle some forming a cheese consistency. What exactly is pork mince? Hi Sally. Pork mince is ground pork, usually made with fatty off-cuts rather than from premium cuts so that it’s not too dry. Hey Vicki. Thanks for stopping by. If we have leftover koldunai we often brown them on the pan to reheat them. Something about those crispy edges really adds to the flavour – yummy! Hi there! If the beef was very lean you would probably want to add some suet for flavour and to ensure the cooked meat is not too dry. My pork mince already had some fat through it so I didn’t need to. Hope that helps! Those look fantastic!! The onions and bacon on top – genius! Yeh, fried bacon and onions are hard to beat! I’d eat that on its own! Thanks Katie. I know 100 seems like a lot but they freeze brilliantly and cook quickly from frozen so I always make a big batch while I’m at it. The proportions can easily be adjusted if you prefer a smaller quantity. By the way, your blog looks gorgeous – now following! The “mom” option sounds like a good plan, Asta. Moms always know best when it comes to traditional recipes! Yum, might have to try this! I love learning about the food of other countries. Exactly, Margaret! All the mince from our recent pig went into these. If there’s a little bit of fat in the mince, all the better! Every nation/region seems to have these types of dumplings. In Germany, there’s Maultaschen, and in China, I’ve had jiaozi, both served in broth. Yeah, they’re all pretty similar, Simone. I tried the cooking water and it wasn’t very good, but I’ve been thinking of pre-cooking these and then serving them in a broth. Lithuanians love light broths, so I think it would work well.